As much as I like to think I spend quite a lot of my time cooking in the kitchen or playing with the kids in the living room, the fact is that I spend the majority of my time in the...... bedroom. Now, that is coming from someone like me, someone who doesn't sleep a lot in the past and still don't sleep a lot now. I mean, hello? 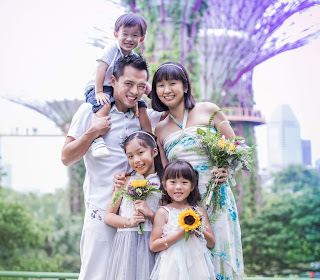 How else can I manage to look after three kids without help, with a hubby who returns home in the wee hours and with a blog that I would like to say is still very active? Right, sleep less. That said, I came to realise (to my horror) that my kids are kind of like me, sleep late and sleep little. I blame it on my lack of scheduling, on not being strict about bedtimes, on not setting ground rules like who gets to sleep where and on not making the kid's bedroom a bedroom per se. So, all that had to change when we moved and I really, really wanted to do up the rooms nicely and transform them into warm, cosy places where the kids can look forward to a good night's sleep. Considering how small the two kids' rooms are with an area of 8sqm each, there was only one main piece of furniture I had to focus on for each room and that is..... the BED, of course! I reckoned beds were a worthwhile investment and I didn't want to get just any bed; I wanted beds which could be customised to our liking, serve our needs and were beautiful, eye-striking and inviting. When I happened to come across Kids Haven, and went through their e-catalogue of customisable beds, I instantly knew that this was exactly what my heart sought after. For a tour of the girls' PINK room, go here. For a tour of the boy's BLUE room, go here. In this review post today, I will share with you more about our experience and share with you more about our beds from Kids Haven too. As one of Singapore’s leading destinations for children furniture, Kids Haven focuses its products on quality, design, price and safety, offering kids an ideal place to play, learn and grow. Their products include beds, bookshelves, storage boxes, study tables, toy storage organisers, bedding sets, rugs, wall displays, decals, jewellery boxes, kids accessories, ceiling lights and more. I loved looking through their extensive catalogue and it wasn't until after many rounds of discussion and decision-making, including making a trip to their showroom, before I decided on a triple deck bed (it's actually a bunk bed with a trundle bed at the bottom) for the girls and a loft bed, along with shelves and cupboards, for the boy. On the day of the delivery, which happens around 2-3 months after your order is placed, two of the workers from Kids Haven came and the whole installation process took approximately three hours. I thought that was quite a short amount of time considering the vast amount of work to be done. Piece by piece, plank by plank, the bed frames got set up gradually and screwed in place. I was happy to see how the colours of the beds turned out and the vibrant hues of blue, purple and pink were just the colours that I had envisioned. One thing that really bugged me was seeing some dents and marks on the wood and I was told that it was inevitable because these came from the original wood from which the pieces were cut out from. What I was assured was that the workers would help me to touch up as best as possible and my advice for you as a customer is that you have to be very meticulous in checking so that no major spots gets overlooked. For instance, one of the steps in the girls' room had a significant dent and it was after I pointed it out that the workers patched it up using some cornice powder. Other than that, I'm satisfied with the quality of the wood and the workmanship provided by Kids Haven. First, let me show you about the girls' bed, which they really love and look forward to sleeping in every night. Isn't that great news for any mum? In fact, the girls can now go to bed on their own when it's bedtime and I don't even need to accompany them, giving me time to just concentrate on getting the sticky, still-being-breastfed toddler to sleep. Ta-Dah! Yes, here's the personalised pink and purple bed for the girls - the Little House Double Deck with Trundle and Ladder Drawers. What I like about Kids Haven is that you get to customise your own bed frame - from choosing the design, the colour, raising the height of the upper deck, choice of a single/super single sized bed, motif design, type ladder and so on. What I did to let the girls love their beds so much was to involve them in the selection process, even if it meant I had to lug three kids and a pram with me all the way to the showroom in Ubi. Yes, the girls were the ones who decided on this design, who chose purple and pink for their own bed frames and who wanted the 'A' and 'heart' motifs at the trundle. I like the Little House theme because not only does it look welcoming and homely, the 'roof' also acts as a rail guard and prevents the kids from rolling over. We do place a mattress onto the trundle and pull it out every night, just in case of them ever falls down. You know, I was initially very tempted to get a slide for the girls. However, firstly the dimensions of the slide wouldn't fit into the room, secondly we tried it out and it wasn't as slippery as I thought and thirdly, part of me knew they would outgrow them and it was wiser to be more practical and get a bed design that can possibly last us for the next decade. So, we decided on getting ladder drawers instead. This means that the ladder steps also function as drawers and give the girls more storage space for their toys, books, accessories and so on. This is something we needed very much because of the lack of a storeroom in the house. Not to worry, the steps are very sturdy and strong nonetheless and there is also a handrail for you to hold on to. Just be careful not to pull the drawers too hard as they might slide out of place and you will need to put them in again. Moving onto the boy's room. 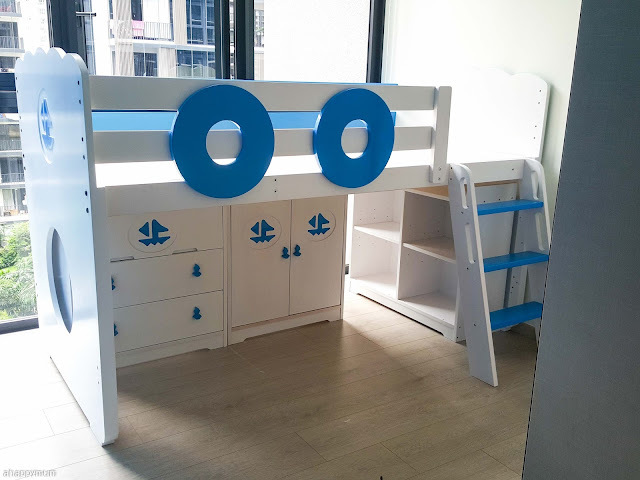 here's the Nautical Loft Bed that comes with a chest of drawers, mini wardrobe and grid shelf. This was the perfect theme for our boy, who has a submariner dad, and I love the boat motifs, lifebuoys and even the cute, special knobs, which can be personalised to your liking too. I needed more storage space because this room would double up as the playroom for the kids and the extra drawers and shelves would come in really handy. Now you know where we keep our Sylvanian toys in the new house. 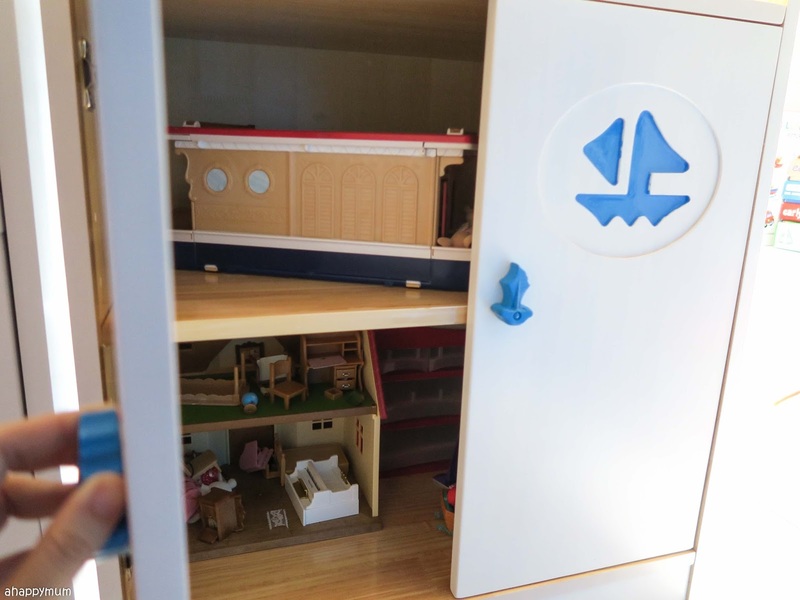 Yup, these toys require quite a bit of space and while we didn't have this luxury previously, these adorable toy sets now have a storage cupboard of their own. I did find that the knobs, though pretty, can be a little hard to pull, given the unique but odd shape. Well, I guess that might be a blessing in disguise because this would mean that the toddler will be unable to open the drawers or cupboards on his own. Now, we have to be fair, don't we? So, small parts might be out of reach what the toddler can easily reach for will be the puzzles, books and toddler-friendly toys that we have displayed on this grid shelf. You might be surprised but even for a ladder, there are different designs to choose from. You can also determine where you want it to be positioned, for instance at the front or side, and you can also choose your desired colour too. Yes, it's customisation to the littlest details and I love it. Last but not least, I wanted to make the room more fun and exciting since it's going to be the playroom and thus, I decided to get a canopy and bed curtains so that we can pretend to be camping for now. It took us some time to wait for them to arrive since I specially chose this shade of blue to match the bed but I think it was well worth the wait. See the porthole on the canopy and the tiny door and windows on the bed curtains? Yup, just too cute. So, you are supposed to install the canopy and curtains on your own and while that might sound easy, the fact that no instructions were given, that there were so many tension rods to fit into the canopy, that the curtains were heavy and thumbtacks had to be use to secure the velcro tape, it took me a couple of hours just to figure it out and get everything set up. Just so you know, the curtains and canopy are not made of cheap plastic but of durable, quality fabric so that they can last. Seeing it all done gave me a huge sense of accomplishment and the fact that the girls' faces lit up when they saw the bed the next morning made everything even more satisfying. The kids' bedrooms definitely look bright, beautiful and cosy now - just the way we hoped they would be. And the beds? Well, they are definitely my dream come true and I'm grateful and happy that the kids can have a good night's sleep every day now (Guess what, we got them new mattresses too!). Sweet dreams, my dears! 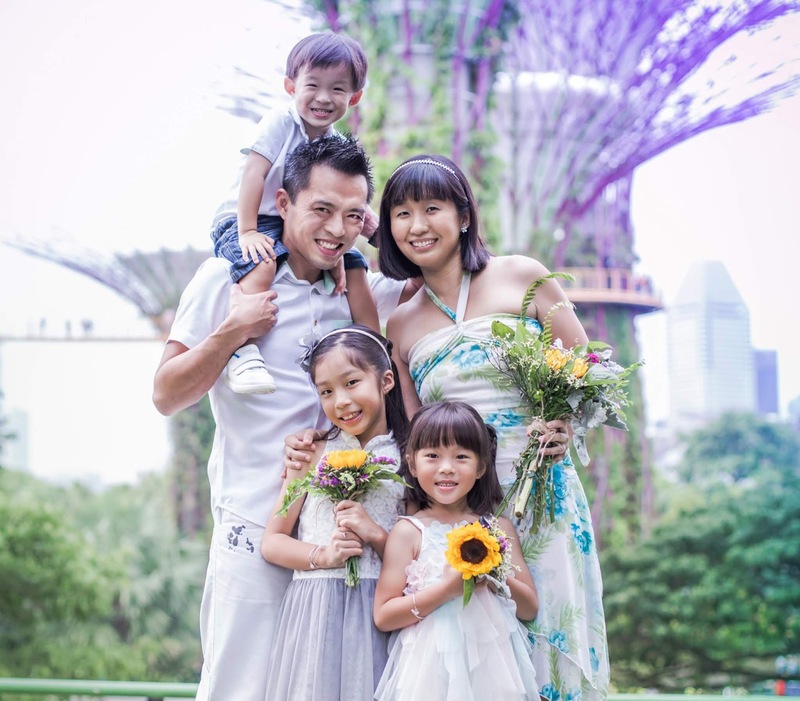 To find out more on Kids Haven or view their catalogue, visit www.kidshaven.sg or their Facebook page. For sales or product enquiries, you can call or Whatsapp them at 9178 0225/9647 6711 and visit their showrooms located at Joo Chiat (166 Joo Chiat Road) or Westgate Mall (3 Gateway Drive #04-14, beside Jurong East MRT). Disclosure: This is a semi-sponsored review for Kids Haven. We received a special pricing for the above mentioned products. All opinions are our own. Recently we bought a loft bed from Kids Haven. The workmanship is very poor. They have a number of white stickers to cover the holes and the paint work is ugly. The worst thing is the bed squeak a lot. When we request them to take a look, they replied us that the squeaking sound is normal. How can it be normal for a bed? With so much squeaking, how can one sleep on the bed. We ended up inspecting the bed ourselves and realised some of the slats are bended or shorter than others. We requested them to change and they replied us to go to their warehouse and change ourselves. With such service and workmanship, it is indeed over priced. Buy at your own risk. Thank you Summer for writing such a detailed post about us. We hope you and your family continues to enjoy bedtime in our beds! As for the customer who wrote this comment about our bed on 10 Apr, we are sorry about your experience but we would like to highlight that our Customized Beds are made of pine wood and are hence imperfect, which is also highlighted during the point of sale, and is also seen in our showroom display piece. This point is also noted in this blog post. Also, the bed slats is meant to support the mattress, the squeaking is exaggerated - which can be verified in our showroom. Our main selling point is the customization - where you can decide the colour, design and dimensions at reasonable prices. For other interested buyers, please do take a look at our showroom pieces to assess for yourself. We have never represented that our workmanship is top-class, but one thing we do value most and are confident about, is structural safety, design and the ability to customize. We hope that clarifies, but if any of you do have further questions, please email us at enquiries@kidshaven.sg and we are happy to attend to you. Customer service is of utmost importance to us. Regards, Kids Haven.